I don’t think I have mentioned this before, but I just started my first semester of grad school, for a Doctor of Architecture program. So far, I am enjoying it immensely! I had initially planned to go into architecture but was convinced to study civil engineering for undergraduate instead so that I had more understanding of the technical as well as the design sides of things. At any rate, since studying engineering is so vastly different than more artistic focuses, this is the first brush I’ve had with Photoshop. We’ve only had a very brief run-through of a few basics in the digital presentation class, as there are other programs getting more focus, but I thought it seemed like somewhat of a milestone (for me at the least). As such I present to you my first ever photoshopped image! 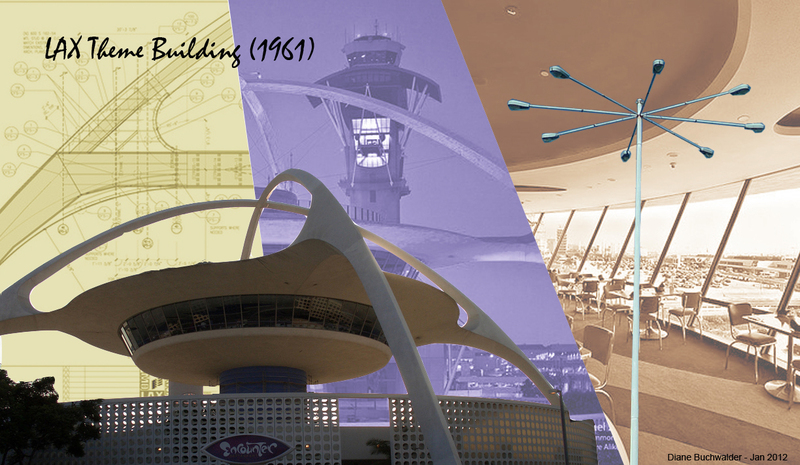 This is an image-based analysis of the LAX Theme Building. I really love the shape of it (and the lightposts, too, check those out! ), but I also tried to include a sense of the interior and the location in the analysis. I don’t think it’s too bad for a first try! I’m looking forward to learning a lot more about how to use Photohop, Illustrator, and other related programs. In other news, since I’m doing more design now (all design all the time! ), I’m going to try to update two to three times a week. So keep a weather eye out!